La Flèche Wallonne maybe be considered a mid-week warm-up for Sunday's Liège - Bastogne - Liège but the finish atop the steep climb of the Mur de Huy, always creates a spectacular finale and leaves riders gasping for air and fighting the searing pain of lactic acid in their legs. The Ardennes exalt the skills of the hilly classics riders but La Flèche Wallonne is more suited to the specialist power climber, who may struggle with the attacks and fighting for position at the Amstel Gold Race or Liège - Bastogne - Liège, but who excels at producing that final effort on the 9.3 per cent gradient of the 1.3km Mur. If a rider times their effort to perfection, they have just enough left in their legs to accelerate up the steepest sections and then hold their lead to the line and win. If they go too early or hold back too much, they will be beaten. Not surprisingly the roll of honour includes legendary power climbers such as Eddy Merckx (a three-time winner), Bernhard Hinault, Moreno Argentin and Laurent Jalabert. Even Lance Armstrong added his name in 1996, as the lone US winner, a few months before he was diagnosed with testicular cancer. This year's race route again covers a distance of 201km, with the start in the shadows of the Charleroi football stadium before a 130km ride east to Huy for the first time up the Mur and through the finish area. There then follows a loop through the Ardennes hills between Huy and Namur before a second time over the Mur and a final, smaller circuit that sets up the riders for the finish atop of the Mur one last time. Position and efficiency is vital during the race, especially on the climbs late on, so that the riders have as much strength and freshness left in their legs for the final climb of the Mur. 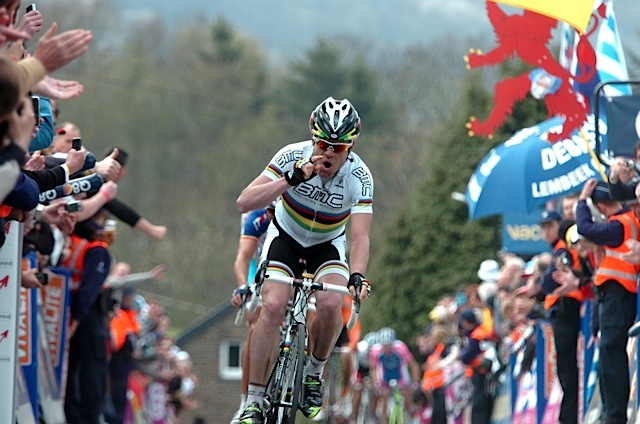 Cadel Evans (BMC) stormed to victory last with a perfectly-timed effort on the Mur while wearing the world champion's rainbow jersey. He was hoping to defend his victory this year but a minor knee injury incurred in a crash while training has forced the Australian to miss the race and all the Ardennes Classics. Alberto Contador made his effort too early last year and could only watch Evans surge past him to win, with Joaquim Rodriguez also passing him to take second. Contador is back this year as he awaits the outcome of the UCI's appeal at the Court of Arbitration and seems determined to prove a point. However other teams and riders are also desperate to win, after so far missing out in the major races. Joaquim Rodriguez (Katusha) tried to anticipate Philippe Gilbert at the Amstel Gold Race but the Belgian surged away from on the Cauberg. Things will be different on the steeper slopes of Mur, with Gilbert forced to fight gravity, while Rodriguez hopes to dance away and win. Robert Gesink (Rabobank), who was suffering with cramp at the end of Sunday's Amstel Gold Race, is also better suited to the near vertical finish, as are Damiano Cunego (Lampre-ISD), Samuel Sanchez (Euskaltel-Euskadi) and Rigoberto Uran (Team Sky). Ryder Hesjedal (Garmin-Cervélo) will lead a strong squad that is set to include pure climber Dan Martin, Christian Vande Velde and Christophe Le Mevel, while other big name outsiders include Ivan Basso (Liquigas-Cannondale), Philippe Gilbert (Omega Pharma-Lotto) if he can power his way up the climb, Alexandre Vinokourov (Astana) and French revelation Jerome Coppel (Saur-Sojasun). Andy and Frank Schleck lead the Leopard Trek team and after Andy was caught 500 metres from the finish at the Amstel Gold Race and Frank crashed out, both will be looking for revenge on the steep slopes of the Mur.